This Clean Eating Strawberry Chia Seed Spread was supposed to be jam. 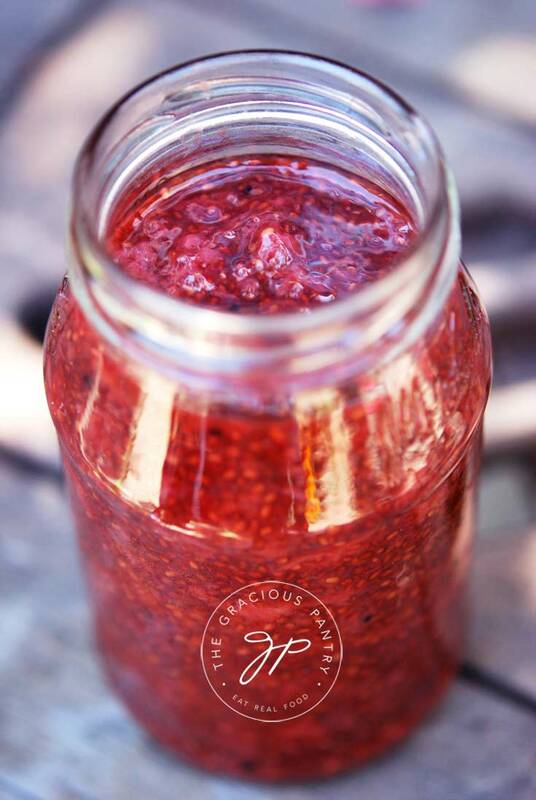 A reader emailed me and asked me if I had ever made jam using chia seeds. The theory being that the gel from the seeds would thicken the jam. I had been thinking about making strawberry jam so I decided to try it her way. The results were not what I expected, but delicious just the same. This is NOT a really sweet spread. It’s mildly sweet and would perfectly compliment some nut butter on a rice cracker. In other words, a fantastic addition to any nut butter snack. It’s great for a low sugar spread on whole grain toast or even complimentary to vanilla ice cream if you don’t want to get too sickeningly sweet with ice cream toppings. It keeps in the fridge for about two weeks, give or take, and is an all-around good spread for most foods that call for a sweet topping. Enjoy this delicious spread over your morning, whole grain toast or even over a little vanilla ice cream if you're being decadent. Reduce heat slightly so the contents of the pot don't splatter all over your stove, but still bubbles in the pot. Stir constantly! The chia seeds burn on the bottom of the pot very easily. So keep stirring (I had to change pots half way through because the seeds burned so easily). There is no way for me to know exactly how far you will boil down the spread, and therefore I have no idea how many servings this will end up being for you. The below numbers are for the entire recipe. Simply divide by the number of servings you end up with. Please note that the nutrition data below is a ballpark figure. Exact data is not possible. Thanks Tiffany! I tried to make it myself as well and it turned out pretty good. My recipe was similar to yours. I’ll try yours this weekend because I’m almost out. This is so much better than store-bought; you actually taste the strawberries and not the sugar. That looks beatutiful, and delicious! Most fruits contain some pectin(the good-for-you soluble fiber) but apple and grape skins contain the most. You could simmer the skins in water to just cover, then strain out the skins and use the liquid to thicken your jam. It’s what people did before packaged pectin became available for jam and jelly making. I never had “store jelly” growing up because my mother always made it from the berries we picked wild or at pick-your-own farms, and peaches, plums and cherries from GrandDad’s trees. Also the glaze part of my fresh strawberry or peach pie recipe would make a really good spread or topping (over cottage cheese or swirled into yogurt, etc) with a little bit more agar if you want it thicker than it is. I never thought of using chia seeds as a thickener. What a great idea! So how long does it last in the fridge..sounds simple and yummy! Angela – I’d say about 2 weeks, but I’m not sure because it didn’t last that long here! This is cooling in my fridge now. I added the chia seeds near the end of the process (I was afraid to ruin my new cookware if I burned the seeds, ha!). I may not have gotten the thickening that was intended from the seeds, but it seems to thickening well as it cools. After boiling down and measuring, I got about 1.5cups = 24 tablespoons @ approx. 16cals each. 😉 Can’t wait to try it on pb toast. Thanks! Tasha – Fantastic! Let me know how it turns out for you. I’d be curious to know if it still gelled. Its STRAWBERRY PICKING SEASON! Do you think this would freeze well? And where did you get chia seeds? Clarisse – I could be wrong, but I doubt this would freeze well. You’re better off making a compote if you need to freeze. I got the chia seeds at Whole Foods. But I believe most health food stores will carry them. Jaynelein – I really couldn’t say. I’ve never cooked with stevia, so I have no idea how it would work. Sorry. I made some stevia-sweetened plum “stuff” last week, not thick enough for jam, too pulpy for syrup. I think I’ll re-cook a couple jars with chia. Thanks for a great idea! MaryLynn – Plums usually cook down enough to be thick. Try cooking them longer. I’m sorry but I know nothing about canning. Perhaps you can email the recipe to somebody who knows about canning. Best of luck! 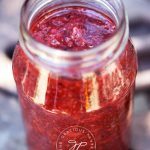 Made a raw, strawberry rhubarb jam tonight using my Vitamix! Pureed the rhubarb really well with a little water so it wasn’t stringy. Added the strawberry’s, a little agave and chia seeds, mixed on low so it was still chunky. The original recipe calls for dates to help with sweetness and thickness but I didn’t have any. Super easy and so good!! From what I have been reading about chia seed jam, they add the seeds after everything is cooked and then put in fridge. Adding more or less depending on consistency wanted! Hope this helps. I’m going to try this for sure & i think that if you soak your chia in your water for an hour or so before starting the process you might get a more gelatinous situation… not sure, i’ll report back. I wonder. .could I substitute the honey for agave nectar? You could, but agave isn’t clean. Just so you know. But yes, you can sub in equal amounts. how does this come out to 904 calories?? Made this tonight and it turned out beautifully. Followed your instructions to a tee. I had a little bit extra that wouldn’t fit into the Ball jar, so I just ate it straight. Oh my gosh, is it delicious! Thanks! Chia seeds are only 65 – 70 calories per tablespoon (according to my bag of organic chia seeds that I bought from Sprouts)…that wouldn’t equal up to enough calories to make this 904 calories. I figured it at home and it came out to be not quite 400 calories total. Just made some for the first time! Oh my goodness! Soooooo goooood 🙂 I added 1Tbs of coconut sugar though for a tiny kick of sweetness. Delicious! You can do this also without cooking the berries at all. We grow organic Kiowa blackberries on our farm and I did it with the washed berries by just adding to the food processor 1 cup berries, 1 T. chia and sweetener to taste. (honey, stevia, maple syrup). Just blend and put in a jar in refrig overnight. I just tried it today with wild mustang grapes that I slowly cooked down, strained out skins.stems and seeds, added juice back to pot with organic sugar to low heat to melt sugar, then took off heat and added chia seeds I processed in vitamix to make more of a powder to add to jelly juice. Put in jars to set up in refrig and I hope it works ! @Sonii – did it work because a girlfriend just gave me a ton of mustang grapes. Please, please let me know because I would rather go that route than the traditional method. could you make this recipe easier (less stirring) if you cook the chia seeds separate? Lauren – I don’t know. I’ve never tried. Worth a shot though! I don’t understand the need for cooking. Why not just chop or mash some strawberries, add chia and water, some sweetener (honey, stevia, agave if necessary), put in a jar or bowl and let the chia do their thing! If you want more of a jam consistency, use an immersion blender. I bought some strawberries from Florida and they’re so sweet all on their own I wont need additional sweetener. I’m making this “cold” version tonight! Dee – It was just something I tried, that’s all. There was no reason for the cooking other than that is simply the way I did it at the time. Let me know how the cold version turns out! When I became a type 2 diabetic about 7 years ago, I began on a journey to re-create great dishes that are not only low carb, but if possible gluten free as well. I own a supermarket and catering business, so why not make this a cause to help others, which I did. My deli-bakery team and I have created some amazing foods using Californian almond flour, Agave nectar, Xylitol, and have come up with some unique desserts, that satisfy the folks who really need it. Tony – Thank you! And your business sounds wonderful! I’m hoping to open a clean eating bakery myself in the next couple years. It’s a big undertaking, but I think it will be worth it. Michele – I’m afraid I know nothing about canning, and as a result, none of my recipes for formulated for canning. Sorry, wish I could be more help on that. srnapa – That’s interesting! I’ve never heard of that. This recipe really got me thinking. Well every morning I take 1 TBS Chia seeds 1TBS ground FLAX seen 1TBS Hemp seed soak in 3/4 cup of water for 30 minutes and have a thick sort of porridge. So I wondered why not try it witihout cooking. Perhaps some Stevia or Agave instead of honey. I also thought when cooking why not try a tablespoon of unflavored geletan when cooking. I am going to try these and let you know..
Just made this recipe for the second time. This time I used frozen blackberries instead of strawberries. Let me tell you, it doesn’t disappoint! I’m making this right now and can’t wait to try it! I am somewhat confused about refined sugar (I’m on a no added sugar diet, but honey and 100% maple syrup ok). Does the process of heating the strawberries mean that it’s more “processed” only because some of the vitamins and minerals are lost in the cooking process and making it harder for the body to digest the sugars? I wonder if adding tapioca flour would help thicken it. Angie – I’m sure it would! I noticed the comment Jodi made (comment #2) about homemade pectin. Truthfully I would use this over chia in my jams as I don’t care as much for the texture of chia, but prefer that to massive amounts of sugar. My question is how much /how long do you boil down the apple skin/water to get the right consistency for the pectin? I’m interested in canning this recipe but have seen your replies to the previous posts. How long would this spread last in the refrigerator without spoiling? Heather – It didn’t last long enough here for me to find out. Everybody scarfed it down. But I would guess a week or two at most. Though honey is a preservative, so it may last a little longer than that. You can always cut the recipe in half if you are really concerned about it going bad. Hope that helps! Can I make this jam with frozen fruits? Carolle – If you thaw them first, sure! Just make sure you strain off any excess water.